In November this year (2017), the Thames Catholic Parish celebrates 150 years of the catholic faith at the Thames. Reunion organisers are asking for stories from past pupils and parishioners. 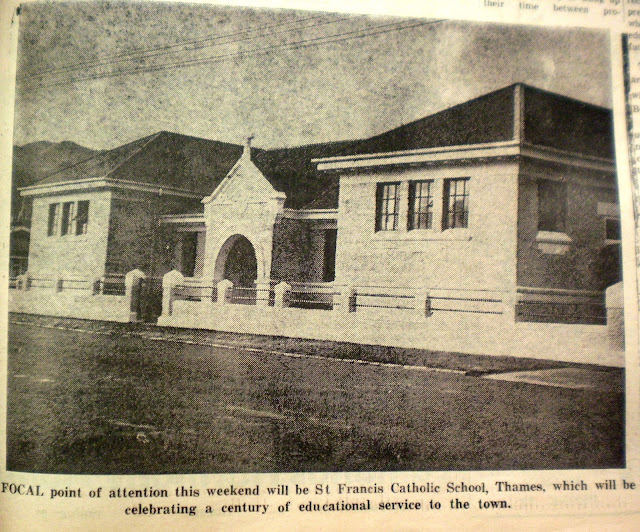 The St Francis School buildings have changed over the decades. Many will remember the old concrete block on the corner of Mackay and Willoughby Streets. That school building was built in 1923 and demolished in 1986. 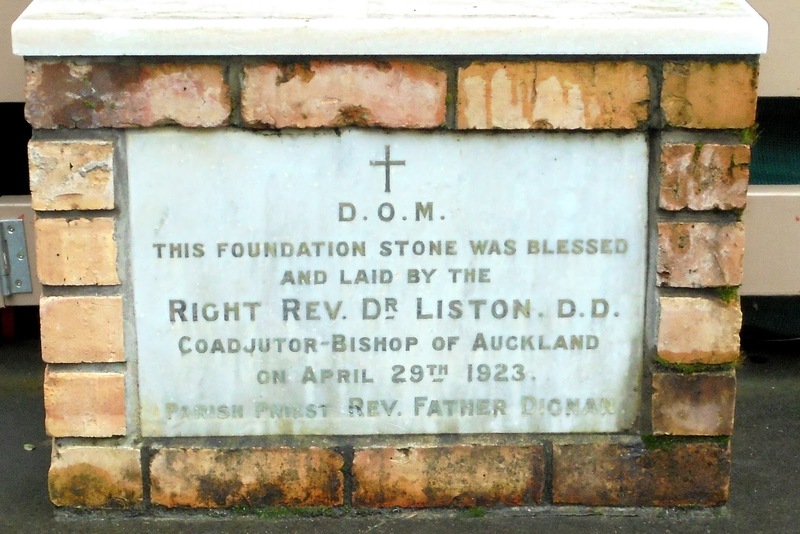 The Foundation Stone for the 1923 building was blessed and laid 29th April 1923. Today it forms the front facade of a drinking fountain at the St Francis School. Sincere thanks to the school for permission to photograph the stone - below. OPENED AT THAMES. BISHOP LISTON’S SPEECH. (By Telegraph.—Special to "Star.") THAMES, this day. The foundation stone of the new Catholic school, Thames, was laid and blessed on Sunday afternoon in the presence of a very large gathering by his Lordship Bishop Liston. The new building will consist of four large class rooms in brick, and will cost £4000, £2000 of which is in hand. Mr. E. Miller (the retiring Mayor of Thames), and Mr. T. W. Rhodes, M.P. (the incoming Mayor), welcomed the Bishop to the district and spoke of the kindly relations of goodwill that had always existed between all sections of the community in the Thames district. The Bishop expressed his deep appreciation of the gracious compliment paid to the Catholic body, as well as to himself, in the presence of the Mayor, the member for the district, and so many members of other creeds. In the course of his address Bishop Liston deplored the enforced absence of religion from the school life of the great majority of New Zealand children, and asked what right any system had to sterilise education in this country of Christian teaching? If there was a power in this Christian land to banish religion from school life what guarantee was there that the power may not banish everything religious from the life of the individual, the family, and the nation. Surely it was time for the leaders of Christian peoples to come together, and, joining forces in this vital matter, insist on the right of the Christian children of this country to receive a Christian education in the schools. The Mayor (Mr. Miller) expressed appreciation of the bishop's remarks and congratulated the Catholics on their enterprise. Money spent on education was a grand investment, and a nation's greatness was measured, not by its miles or millions, but by the moral might of its men. He trusted the school's operations would make good citizens. Mr. Rhodes, M.P., said he was pleased to take part in the ceremony and welcome the bishop to the Thames. He congratulated Thames Catholics on their progressiveness. In Thames, he added, religious bodies helped one another." In 1973, a reunion was held to celebrate 100 years since the school was open. The photo below was taken on the eve of that event in May 1973. It will be without doubt a big occasion for the Church, School and town when hundreds once again gather to share their memories at the end of 2017.